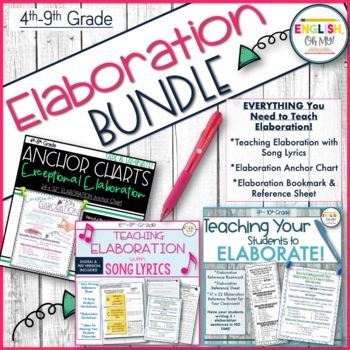 Grab this ELABORATION BUNDLE, and save some $$$! Students have a very difficult elaborating on their thoughts and in their writing, and I have found a system that works for my students in stretching their thinking. With this, I created an ELABORATION ANCHOR CHART for you to hang in your classroom for your students to reference. 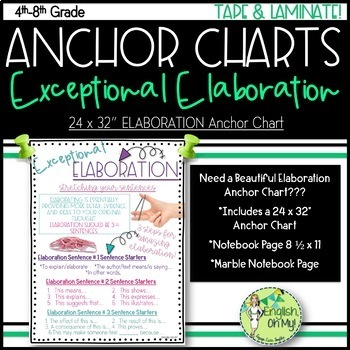 Anchor charts are all the rave, but not all of us have the beautiful handwriting, the artistic genius and the time to create our own; therefore, I am creating them for you to help you save some time! All you have to do is PRINT, TAPE & LAMINATE. Elaboration is a very difficult skill for young writers, and usually when I ask my own students to elaborate, they thinking writing one sentence is sufficient. I have to spend a few lessons on teaching my students the proper way to elaborate and extend their writing. With this, I came up with a strategy to help your students elaborate and make the process easier. Often, our students do not know what to write or how to elaborate. This process may make this skill easier and less inundating. When you ask your students to elaborate, do they write one sentence? 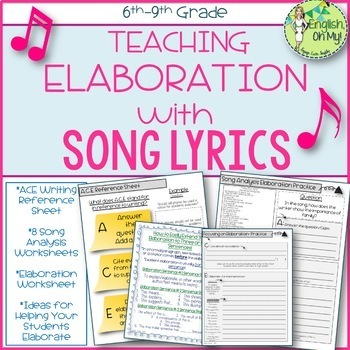 Does your students lack of elaboration frustrate you? I think I have found a solution in making it easier for your students to elaborate, and write 3 or more sentences! I included three categories of sentence starters to help your students elaborate on their thinking. 3. 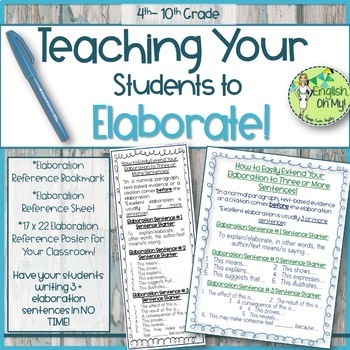 17 x 22 Reference Poster for your classroom! ⭐ Click HERE to follow my store. You will receive updates and releases of my products and freebies. ⭐ make copies for your own classes only. ⭐ AS LONG AS no other teacher has access to that class webpage. This resource is for you, the purchaser, alone. ⭐ make copies for other teachers or their classes. ⭐ distribute this digital resource to other teachers. ⭐ post this resource on any webpage or server that is available for public view, for other teachers. If you and a team of teachers would like to use this resource together, please purchase additional licenses on the resource purchase page. That’s right! Leave feedback on this product, and you will receive credits for your next purchase. I would greatly appreciate it if you contact me first if you have an issue with the product before leaving feedback. I will be more than happy to accommodate you! Just e-mail me at englishohmy@gmail.com.